After more than nine seasons as television’s Dog Whisperer, Cesar Millan has a new mission: to use his unique insights about dog psychology to create stronger, happier relationships between humans and their canine companions. Both inspirational and practical, A Short Guide to a Happy Dog draws on thousands of training encounters around the world to present ninety-eight essential lessons. 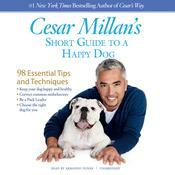 Taken together, they will help any owner apply the key aspects of Cesar’s celebrated philosophy to create the most fulfilling life possible with their dogs. • helping your dog adjust to life transitions. 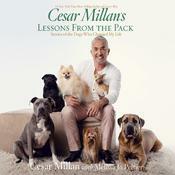 Throughout the book, inspiring stories from Cesar’s case files—and from his new show, Leader of the Pack—provide moving real-world applications and surprising life lessons. Smart, easy to use, and packed with Cesar’s remarkable insights into human and canine behavior, A Short Guide to a Happy Dog is an inspiring tool for anyone looking to live a better life with a beloved member of the family. Cesar Millan, star of National Geographic’s celebrated Dog Whisperer and Leader of the Pack, is the most sought-after dog behaviorist in the world and recognized for his particular expertise in canine psychology. He is author of the New York Times bestsellers Cesar’s Way, Be the Pack Leader, A Member of the Family, and How to Raise the Perfect Dog, as well as the founder of the Dog Psychology Center in Los Angeles. In addition to his educational seminars, he has established the Millan Foundation, a nonprofit organization dedicated to helping shelters and rescue groups. He is a recipient of the National Humane Society Genesis Award Special Commendation for his work in rehabilitating shelter animals.